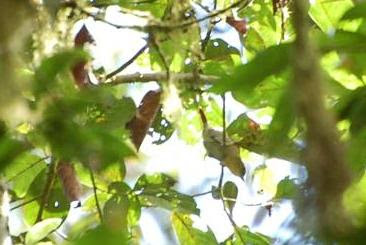 Guido Berguido sent in the following report of his July 19–20 trip to Cerro Chucantí, together with Olmedo Miró, Ovidio Jaramillo and Michael Castro, among others. Although it wasn't really a birding trip, we had binoculars along and did stop for birds. We recorded some nice species like Crimson-bellied Woodpecker, a pair of very vocal Black-crowned Antpittas, and even a Rufous-vented Ground-Cuckoo at a large antswarm. 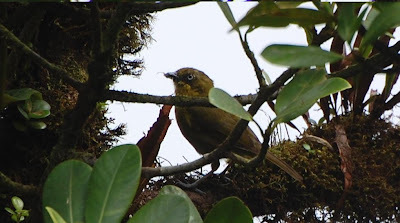 We saw most of the target birds for the area like the Varied Solitaire, Violet-throated (Emerald) Toucanet, and Violet-capped Hummingbirds; but our greatest highlight was when Ovidio Jaramillo managed to get some shots of two very desired birds, the Tacarcuna Bush-Tanager, a regional endemic, and the national endemic Beautiful Treerunner.